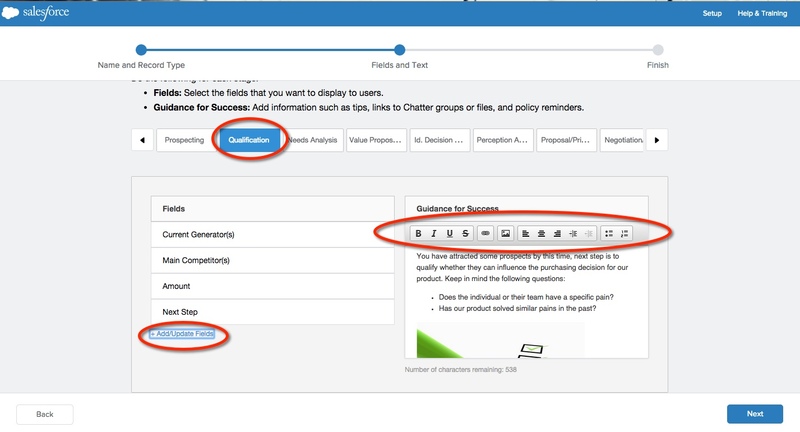 Salesforce Path is a key Lightning feature.Path guides users along steps in a process, such as working an opportunity from a fresh lead to a successfully closed deal. Path is available for leads, opportunities, quotes, contracts, orders, and custom objects in Lightning Experience. Here is a short list of benefits of this powerful tool as well as features I believe that will take Path to the next level! Path allows for robust reporting by each stage of the Path, and it allows for a quick snapshot of where each record stands in the path. Path also works very well with Process Builder. With easy to use IFTTT, Process Builder allows the creation of business workflows from the movement of records in Path. Path allows for custom text at each stage of the path. This allows for a custom message at each stage providing extra communication to help move the user through to the next stage. You can add up to 5 fields at each stage of the path for the user to add information. This is a great tool if certain information is need prior to moving to the next stage of the Path. Salesforce path has a limit of 5 fields to add at each stage of the path. I think it would be great if they didn’t put a limit on this. Sure, you don’t want to have 15 fields under 1 stage of the path; however, I feel like some situations call for more than 5 fields. Here is the idea on Salesforce if you would like to vote. Make certain fields required once the user is at that stage of the path. Example, at stage 1- you may not have the information needed to make that field required; however, at stage 3, it would be great to now make that field required before letting the user move to stage 4. Hide certain sections that aren’t relevant at that stage of the page. this allows for a more simplistic look of the record page. If information isn’t need until stage 3, it would be great to hide that information until stage 3 is clicked. Here is the idea on Salesforce if you like to vote. I’ll keep it short. Let me know your thoughts! For more information, check us out at www.bertechllc.com.